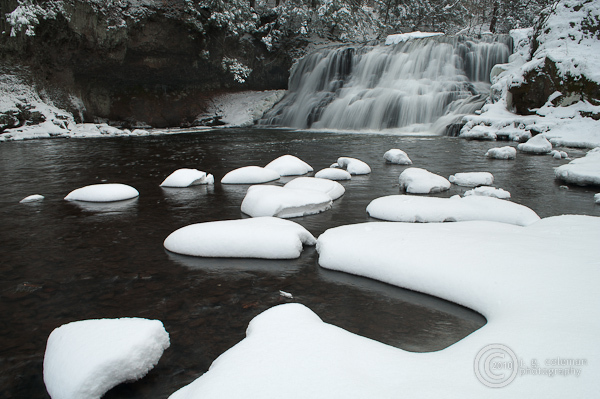 Despite freezing temperatures and a fresh blanket of snow, Wadsworth Falls is still flowing swiftly. Wadsworth Falls State Park is named after Clarence C. Wadsworth, the original owner of the property. In the 1940’s, Wadsworth donated more than 250 acres of the land to the State of Connecticut which comprise the park grounds as we know them today. His old mansion still stands nearby, though it was not part of the donated parcel and remains privately-owned. Photograph of Wadsworth Falls © 2011 J.G. Coleman Photography. View more photography by Trails of Freedom Chief Researcher, Justin Coleman, at J. G. Coleman Photography.